Unniyappam is a very popular Kerala snack prepared from rice, sugar, jaggery and ghee. Keralites prepare it mainly during some festivals like Vishu, or during family rituals and functions. If you start eating it, you feel like having more. When writing a post about Uniyappam, it will always remain incomplete if I miss about Kottarakkara temple because its the main offering in Kottarakkara Ganapathy Temple in Kerala. Cooked with secret ingredients (the priests are willing to disclose the ingredients, but quantity of each ingredient is a secret) the Kottarakkara unniyappam has a special taste. This sweetness attracts devotees around the globe. Irrespective of caste and creed people queue before the temple for getting it. It is believed that unniyappam was the first offering given to the Lord Ganapati after the installation by Perunthachan ( an ancient legendary carpenter, architect, woodcarver and sculptor from Kerala, India) and custom is till continuing. There is also another myth behind this offering in the temple. The King of Kottarakkara who was not having children, offered to cover Lord Ganapathy with unniyappams, if he is blessed with a son. With God’s grace he got a son and when the King tried to fulfill his promise, with how many ever unniyappams cooked, it was not sufficient to cover Ganapathi. The King became sorrow and prayed to Ganapati that he will give it as offerings from sun rise to sun set and that started Udayastmana Pooja of the temple. Unniyappam is given to those believers who offer adoration on the days of this pooja and all the Udayastamana Poojas till 2026 have been booked because it will fulfill your wishes! Rinse and soak rice overnight in water for around 4-5 hours. Drain the water and grind it to a semi coarse batter. Grind the bananas (preferably palayamkodan pazham / Dwarf Cavendish) to thin paste. Add the melted jaggery (strain it, if it has impurities) to the ground banana and make it into a fine paste. Mix together rice batter, maida, banana – jaggery paste well. Add water little by little, but the batter should be semi thick (not be too thin nor too thick) with dropping consistency. Fry the coconut bits in the ghee and keep it aside. Add the fried coconut bits, sesame seeds, cardamom powder and baking soda to the batter. Keep it Idle for 30-45 minutes. Heat oil is paniyaram pan /unniyappam kara / appachatti, and when the oil is hot, lower the flame to medium. Drop tablespoons of batter to the pan and fill the pits with the batter up to a little more than 3/4th full. When the bottom get a golden dark brown, turn the unniyappam with a spoon and cook the other side too. Once cooked, remove and drain on a kitchen towel. 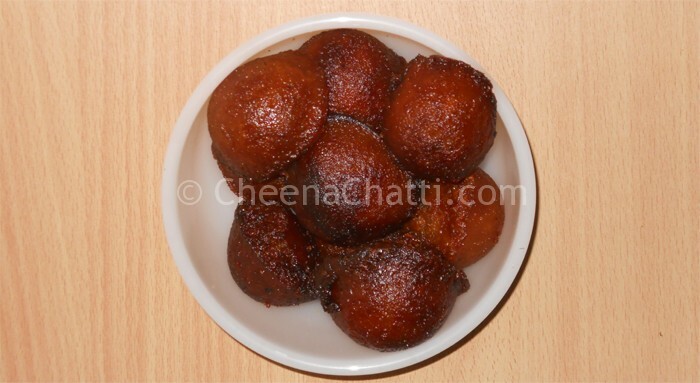 This entry was added on October 6th, 2013 by Jameela Beevi in Bakery and tagged with nadan snacks, kerala snacks, make unniyappam, south indian unniyappam recipe, best unniyappam, nadan palaharam, unniyappam recipe in malayalam, unniyappam kerala style, unniappam. Last revised on March 26th, 2018. Maida can be replaced with wheat flour, I tried it and came out very well. Thanks for the tip Latha. The tradition & story about Ganapathy is interesting. It came out awesome… Great recipe.. But u know wat I didn’t add maida… Thank you…. @Nisha :Thank you so much 🙂 Very glad to know that you liked the recipe and it worked out well for you. Please do try other recipes as well and share your feedback. Before anyone publish any recipe, please have a basic knowledge about its history. Unniyappam is created and still used as an offering to various deities in Hindu temples in Kerala. There is no chance Maida ( refined wheat flour) ever be used in its preparation as it is never allowed in temples in Kerala. Unniyappam traditionally made from coarse rice flour. Period. Hi Das, Agree to your point and thanks for sharing the info with us. But this is a different recipe we are using at home with good results. You can skip it if you don’t want. Many people may have their own modifications. Wow….yummy one…..we can prepare by using atta …….banana….sugar also….but shortcut of this one ….